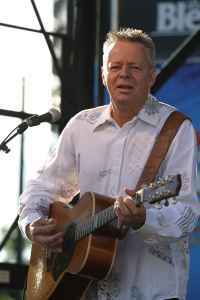 Tommy Emmanuel, AM (born 31 May 1955, Muswellbrook, New South Wales, Australia) is an Australian guitarist, songwriter, and singer, best known for his complex fingerstyle technique, energetic performances, and the use of percussive effects on the guitar. Currently lives in Nashville, Tennessee, USA. Appointed Member of Australian Order (A.M.) in June 2010. Tommy and his brother Phil Emmanuel performed live in Sydney at the closing ceremony of the Summer Olympics in 2000. The event was televised worldwide with an estimated 2.85 billion viewers. When performing together the pair will sometimes share and play just one guitar with each having one hand free. Carries C.G.P. after his name (Certified Guitar Player), awarded to him by Chet Atkins (Tommy's childhood hero and the reason he began playing at the age of 7) in July 1999. Emmanuel has said that even at a young age he was fascinated by Atkins’ musical style – sometimes referred to as Travis picking – of playing bass with the thumb and melody parts with the first two or three fingers at the same time. This technique became the basis of Tommy's guitar style. While Emmanuel has never had formal music training, his playing ability has won him fans from all over the world. He is known to play percussion parts on the body of his guitar. As a solo performer he never plays to a set list and uses a minimum of effects. He usually completes recordings in one take. Emmanuel frequently uses his left thumb to fret bass notes on the 5th and 6th strings as well as playing chords such as Am and E with just two fingers. He uses a thumb pick mostly, a flat pick or just fingers. He also integrates amongst his trademark blazing runs and kaleidoscopic chord progressions a quick note / chord "dive," imitating a tremolo system effect on his fixed-bridge acoustic guitars, by pressing the palm of his right hand against the body of the guitar directly above the fret board close to the neck joint while maintaining forward pressure with his left (fretting) hand. His main guitar is a small-bodied custom Maton EBG808, that is fitted with a pickup and an internal condenser microphone, to which he has given the nickname "Mouse" due to its quieter volume unplugged but massive sound when plugged into an amp. Two of his three main stage guitars, notably his signature TE1 Maton dreadnought, are battered and worn from his excessive playing and percussive techniques on them. He stated in 2008 at a workshop during his annual festival, Tommyfest UK (previously held in Windsor, UK and since 2010 in Harrow, UK) that all three of his stage guitars have been broken and repaired numerous times over the years.